Growing up, we had milk in the house — but, my mom couldn’t drink cow’s milk, so we also often had a variety of non-dairy options. Cashew milk was the most common staple found in our fridge, but there’s another alternative that is taking the lactose-free world by storm. I’m talking about oat milk, a vegan, non-dairy milk substitute that has a range of benefits. Not only will this “milk” support your health, it can also be used within your regular beauty regimen. Let’s check it out! Plant-based nutrition is all the craze, and for good reason. As reported by Mintel, non-dairy milk sales have significantly grown over the past five years, increasing 61 percent since 2012. Of course, the most common options include almond, soy and coconut. There have been a number of studies released in the past decade or so, which has largely influenced the perception of cow’s milk among consumers. In fact, Americans now drink approximately 37 percent less milk then they did in the 1970s. 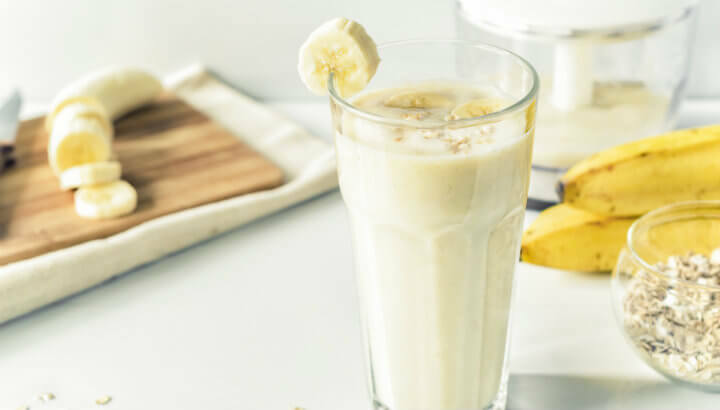 Try oat milk in your smoothies. When it comes to milk and other dairy products, in order to break down the lactose (the sugar found in milk), the enzyme lactase is required. When there is not enough of this enzyme present, lactose is broken down in the bowel, resulting in cramps, bloating, nausea and diarrhea. It is said that around 70 percent of the population will not continue to produce lactase once we are finished breastfeeding (hence the term, lactose intolerant). From the use of growth hormones in dairy cattle to the environmental impact of cow milk production, many are now opting for non-dairy alternatives — including the new kid on the block, oat milk. In its most basic form, oat milk is essentially oats and water that have been blended together. Once strained, a smooth, creamy liquid is the end result. If you’re considering switching to oat milk, here’s why it is an optimal choice. Being free of dairy, oat milk already protects those who cannot properly digest lactose. However, it is also ideal for those who suffer from a nut or soy allergy. Since oats are also typically gluten-free, it’s a great alternative for people with strict dietary restrictions. 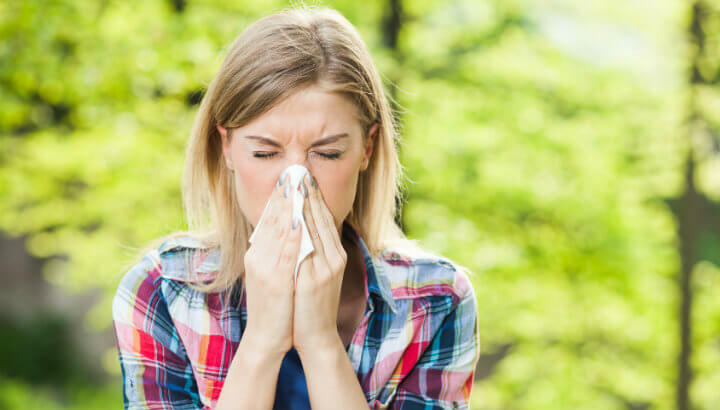 Oat milk is great for those with allergies. Oat milk yields a similar calorie content to cow’s milk. However, it is incredibly high in fiber, as well as beta-glucan. Since beta-glucan effectively binds to cholesterol (specifically LDL or “bad” cholesterol) as it passes through the gut, regular consumption could reduce your risk of heart disease. When you break down the nutrient content of oat milk, you will benefit in so many ways. For those who are vegan, for instance, just one cup of oat milk yields around ten percent of your daily iron intake. In turn, this will reduce your risk of anemia. Commercial oat milk is also often enriched with calcium and vitamin D, supporting bone health. However, if you are going to purchase commercial varieties, be mindful of potential additives (as well as the sugar content). Overall, oat milk is said to boost immunity and supports a balanced diet. Oat milk is nourishing for the skin. Based on its lipid and water content, oat milk offers moisturizing properties, removes impurities and helps eliminate dead skin cells. To combat acne, you can combine oat milk with raw honey. This face mask will leave your skin feeling fresh! Whether you experience little red bumps or itchiness after shaving, oat milk can soothe your skin and provide nearly instant relief. In fact, many women take oat milk directly into the shower with them, as this beauty remedy doubles as an oddly luxurious body wash.
Use oat milk after shaving for irritated skin. Speaking of showers, you can also apply oat milk to your hair, either as a rinse or as a leave-in conditioner. Just as oatmeal soothes dry, itchy skin, the same rules apply to your scalp. In turn, this will help you combat dandruff while you strengthen and nourish your hair. So whether you are looking to clean-up your diet, improve your health or are in need of a new, all-natural beauty routine, oat milk has your back. To whip up your own batch, all you’ll need is a cup of rinsed steel-cut oats, approximately three cups of filtered water, and then for flavor, anything your heart desires (cinnamon, vanilla, sea salt, etc.). They key here is to develop new healthy habits that support both your internal and external health. Utilizing the power of oat milk can act as the first step, as you develop more sustainable health and beauty habits. Once you get comfortable with a recipe you like, have fun with it! Hey Buddy!, I found this information for you: "6 Health And Beauty Benefits Of Oat Milk". 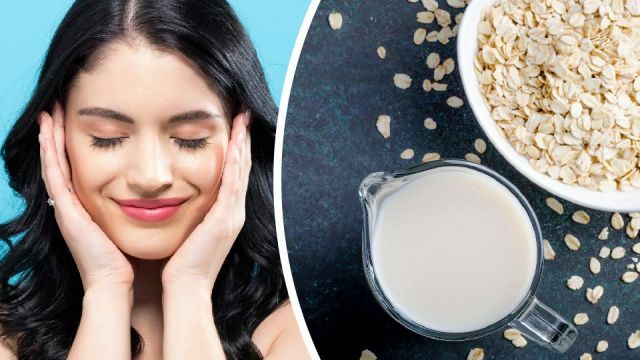 Here is the website link: https://www.thealternativedaily.com/6-health-and-beauty-benefits-of-oat-milk/. Thank you.